Title: 'Nueva Hispania tabula nova'. 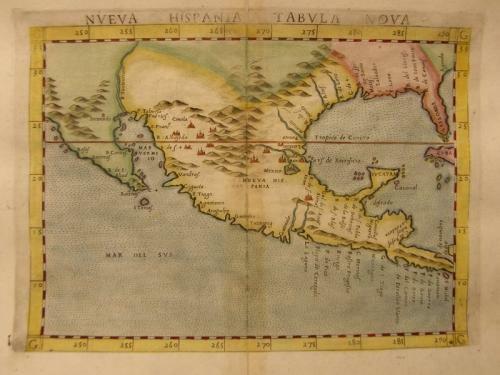 Early map of New Spain, Florida and Gulf of Mexico. The map is an enlarged version of Giacomo Gastaldi's published in 1548. Nomenclature and cartography are unchanged, with the exception of the depiction of Yucatan which is now shown correctly as a peninsula. There are clear signs, however, that the engraver first cut the plate to show an island, as his error was not completely erased when corrected. No example has been found in its insular form. Girolamo Ruscelli's edition of Ptolemy's Geographia included newly engraved copperplates by Giulio and Livio Sanuti. The curious fact is that this map is one of two that were engraved on the same plate, printed and than separated for the book. This can be seen in the atlas by the fact that the plate mark of the map runs off the top of the page. In 1574 a new plate was used which lasted until the final edition of 1599. Very light marginal water staining, some worm defects in the middle fold, restored, slight picture loss. Overall good.